This list began life before the world went on-line. It dates from BPC – Before the Personal Computer became the default tool of the student and researcher. I began to put it together when those interested in keeping up-to-date with events in Nigeria – including coverage of Wole Soyinka’s publications, productions activities and statements – had to travel, had to visit libraries and to spend and time in archives. It was a period dominated by the print-media when, for those based in the UK, West Africa – ‘of blessed memory’ – enjoyed considerable authority as a ‘journal of record’. Dear dead days, unknown to many; almost beyond recall for others. The recent years this list has existed in various states and in various forms; it has existed on different computers and in different programmes. In reading through it during 2013/ 2014 – and in using on-line resources to resolve, or try to resolve, queries, I became acutely aware of inconsistencies and shortcomings. I have, however, permitted this ‘virtual document’ to go out in its present form because, although it ‘belongs to yesterday’, it may still prove of some use for the present and future. Furthermore, I have been persuaded that sharing a ‘work in progress’ is more useful than holding it back while trying to make it a slightly longer list. Soyinka and his work has attracted so much comment, on so many fora, and in so many languages that a list of this sort does not gather more than a fraction of what has been written. The fact that almost all the entries in this list are from English-language sources draws attention to just one of its very many limitations! Nevertheless, I hope that it will prove to be of some use. I would be grateful for feedback from those who visit these ‘pages’, and I welcome suggestions about how they can be made more useful. James Gibbs was born in Wales and educated in the UK and US. He then taught at universities in Ghana, Malawi, Nigeria, Belgium and the UK before retiring from teaching in 2007. His publications include Wole Soyinka (Macmillan) that appeared in 1986, the year in which, with Ketu H. Katrak and Henry Louis Gates, Jr., he published Wole Soyinka: A Bibliography of Primary and Secondary Sources (Westport, Conn: Greenwood). 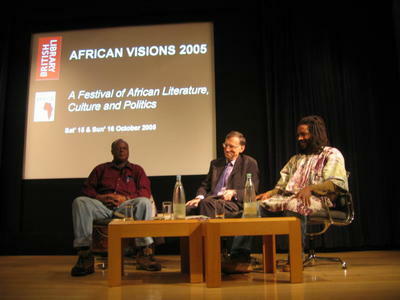 Gibbs has edited two handbooks for African writers, the second with Jack Mapanje (African Books Collective, 1999); in 1993, he and Bernth Lindfors have edited a collection entitled Research on Wole Soyinka (Africa World Press) and, with Kofi Anyidoho, he has edited a collection of essays on Ghanaian Literature, Theatre and Film (FonTomFrom, 2000). His own collection of essays on the Ghanaian theatre, Nkyin-Kyin, was published by Rodopi in 2009. His extensive bibliography on the theatre in Ghana is on line at the Jahn Library site. Gibbs is a founder editor of the James Currey / Boydell & Brewer African Theatre series, and, in 2012, was ‘Guest Editor’ of a volume on Festivals in that series. During November 2013, Bernth Lindfors and Geoffrey V. Davis presented him with a festschrift they had edited in his honour entitled African Literatures and Beyond (Rodopi). Gibbs lives in Bristol where he remains in touch with some developments as reviews editor for African Literature Today and as an external examiner for the University of Ghana.